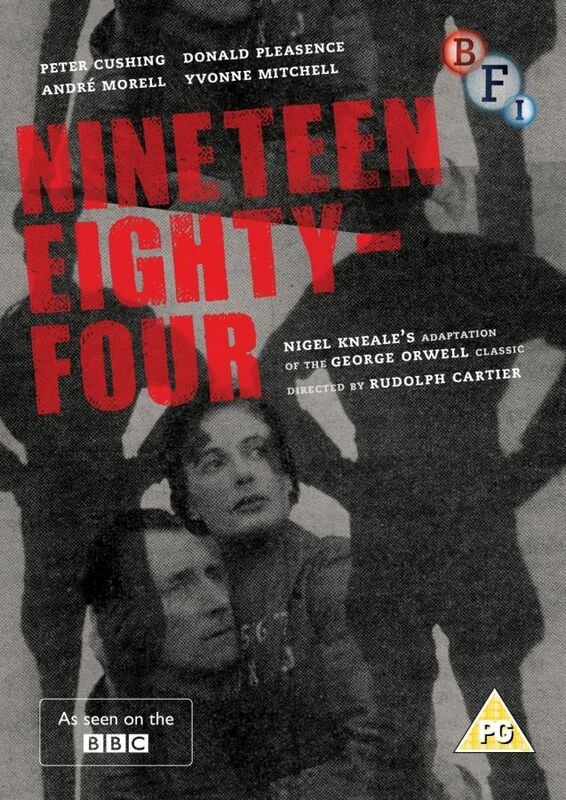 It’s disappointing that the BFI DVD of Nineteen Eighty Four, adapted by Nigel Kneale, produced by Rudolph Cartier and starring Peter Cushing, is still in limbo. The original release date was planned for the end of 2014, then it was pushed back to March 2015. At the time of writing this update (07/03/15) the DVD is no longer listed on the BFI’s website and the provisional release date has vanished from e-tailers such as Amazon, which indicates that it’s not going to appear any time soon. Classic TV specialist DD Home Entertainment claims to have set a new quality benchmark on its restoration work for the 1954 BBC drama Nineteen Eighty-Four. This early landmark of British television, which will be available for the first time ever on DVD and video on November 8th, required extensive work on it, but viewers will – according to DD – find the restored picture even better than when it was first transmitted. In December 1954 videotape recorders (even for broadcast use) were two years away and existed, if at all, only in prototype form in research laboratories. Since 1947 BBC engineers had been able to make crude recordings of TV pictures simply by pointing a film camera at a monitor screen. However, dramas were not recorded until 1953 and Nineteen Eighty-Four remains one of the earliest surviving examples of the art-form. It was recorded at the time using an ingenious system of modified telecine machines. New transfers of the film recording were commissioned from BBC Resources using its highest quality Spirit datacine equipment. Special arrangements were made with the BBC Film and Videotape Library for access to the archive master material, which cannot normally be used. The new copies of the play were graded. This is the process of taking each shot (or even part shot) and adjusting the brightness and contrast. Dirty cuts (where a frame is made of superimposed and distorted pictures from two cameras) were removed or, where possible, repaired using paintbox techniques. Next, every frame of the play was examined and film dirt, scratches and other defects were laboriously re-touched and pointed out by hand. Finally a video process was applied to give the studio sequences the fluid motion appearance that they would have had on original broadcast. The result – one of the earliest surviving examples of British television has been restored to exceptional quality. But the DVD was never released in November 2004, instead it was announced that it had been postponed due to a dispute with the Orwell estate. The 1984 film of Nineteen Eighty Four, starring John Hurt and Richard Burton, had been released on DVD in 2004 and it appears the Orwell estate didn’t want the BBC version to be available at the same time. After this, everything went quiet until the BFI’s press release in July 2014 announced they would release it as part of their Days of Fear and Wonder SF season. And the even better news was that they intended to use the restored master prepared in 2004. It could be that it’s been delayed in order for the BFI to source more special features. There’s some interesting material that could be added, most especially the 1965 version starring David Buck (a remake of the 1954 script). Although it’s missing a few minutes, it would still be a very worthwhile (and long!) special feature. Further information about this production can be found here, in an article written by Kim Newman. Or it could be that the Orwell estate are once again flexing their muscles. If so, it’s their last opportunity, since in a few years their copyright claim to this production will have expired and they’ll no longer be able to block it. It does seem bizarre that the BFI would announce the release without ensuring that all the necessary clearances had been obtained (but then the same thing seems to have happened a decade ago, with DD Video having spent money on a restoration that remains unseen). Whilst it’s hardly difficult to source a copy of the unrestored print via the internet, it was probably the restored programme (along with some decent special features to place it in context – like the Out of the Unknown and the forthcoming Douglas Wilmer Sherlock Holmes DVDs) that the majority of us were keen to see. For now, we’ll just have to wait and see if any more hopeful news surfaces in the future. Anybody who is interested in more detail about the production may find this of interest. Edit (Jan 2016). Unfortunately the BFI DVD has now been cancelled. The reason why isn’t known (possibly problems with the Orwell estate). It does seem remarkable that both DD and the BFI prepared DVD releases which stumbled due to unspecified complications. It possible that someone will try again in a few years time, but for now the restored version remains locked in the vaults. I actually remember seeing a DVD of 1984 starring Peter Cushing in Manchester’s HMV back in the 2000’s. Whether this was the film version or the TV version I am not sure. I never saw it again though! Interesting. There were some foreign bootlegs (I seem to remember a R1 version that was very briefly on sale) so it might have been that. I’ve got a Spanish bootleg of the Edmond O’Brien film which has the Cushing version as a special feature. Sadly it’s the same print that’s been seen on the various repeats (most recently on BBC4). I haven’t seen this version, only the 1984 (no pun intended) movie starring Richard Burton as O’Brien. It’s worth tracking down. Whilst it lacks the cinematic sweep of the Burton/Hurt film, the enclosed studio-bound nature of the majority of the production (although there are some brief film inserts) is very effective. Peter Cushing as Smith and Andre Morell as O’Brien are both excellent (they’d later team up as Holmes and Watson in Hammer’s Hound of the Baskervilles). Seems like Big Brother is alive and well ! YOU have been warned !!! The real joke is that – as you note – the Orwell copyrights will expire at the end of 2020. As 2021 fast approaches the estate may become more flexible, but the BFi/BBC/whoever might as well just wait it out to avoid having to pay them a penny. At least thanks to bootlegs and tv repeats it’s not hard to track down, but it deserves a restored DVD release, with supplementary materials which place it in its historical and cultural context. Hopefully someone will take up the baton in 2021. Just been reading your recent tweets about 1984. Do you know anything about the region 1 DVD that seems to be available from Amazon? I’d say, like previous R1’s, it’ll be a bootleg, no doubt released as “public domain”. If you’re looking for a copy on (presumably) a pressed disc, it might be worth a look. R2, plus you get the 1950’s film as well. The PQ of the BBC version is comparable to the rebroadcasts over the last twenty years – until the remastered version sees the light of day I’d say it’s the best available.